Like the rest of the DiVill series, it spans a huge tonal territory and excels at just about everything it sets out to do - and at this price, that's no mean feat. Superb sounds. Value for money. Founded in 1998 and masterminded by legendary designer Trevor Wilkinson, Italia designs in England and builds in South Korea, keeping costs low and value high. And now Italia has grown large enough to launch its own sub-brand: DiVill. So, if you like the Italia philosophy, but you're looking to save a little extra dollar, DiVill is the place to be, and this vintage-inspired axe with a classic HSS configuration is priced to stun. 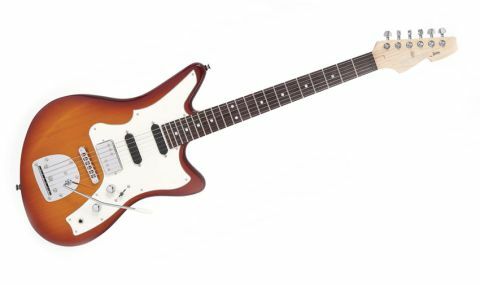 "The neck and middle single coils treat you to a wealth of classic S-type tones"
It may have a wacky scratchplate, but the F100 is a seriously practical guitar. It arms you with hot-rodded HSS tonal firepower, plus a vintage-style floating vibrato system and tune-o-matic bridge, and even Italia locking tuners. It has a speedy unfinished maple neck and the cutaway allows unfettered access to the dusty end of the neck. We noticed a few eccentricities while playing the F100: the vibrato system produces the odd clack or two as it returns to regular pitch, while the bridge's roller saddles can click a little with wide string bends. Still, you're unlikely to notice any of this when the volume's loud and the playing is even louder, which is exactly what the F100 demands. Plug in, and the neck and middle single coils treat you to a wealth of classic S-type tones, from Frusciante funk to Hendrix-y in-between quack, courtesy of positions three to five on the five-way pickup selector. There's plenty of spank 'n' sizzle on display, and they slice through distorted tones with aplomb, too. Kick in the bridge humbucker for a hefty boost in output and killer rock tones at higher gain levels, and the F100 makes an impressive case as a do-all vintage-inspired double-cut.